Pomegranate, was 9 years old and carrying nine dead pups when she was rescued from an Amish puppy mill by the Ramapo-Bergen Animal Refuge, Inc. (RBARI) in Oakland, NJ. The Pomeranian had just three teeth left, a heart condition caused from over breeding and feet splayed out with nails that grow up instead of out. For two years when the other dogs in the household ran towards D’Annunzio, Pomegranate ran in the opposite direction. Today, she’s eager to jump in her “mom’s” lap and serves as a “therapy dog” for new rescues and sick dogs and helps socialize new puppy mill rescues at the shelter. 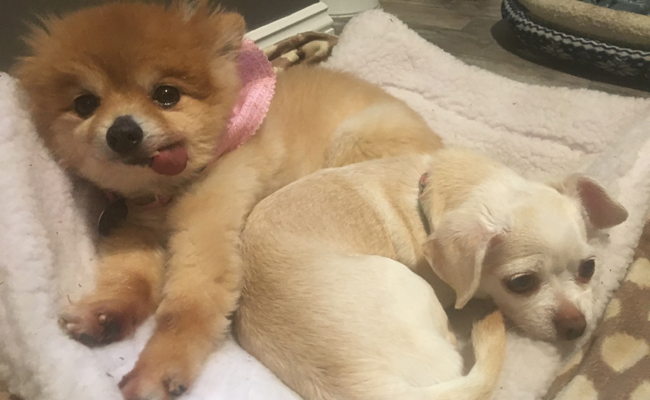 Several RBARI adopters have reported that their rehabilitated puppy mill survivors serve as comforters and role models for newly-rescued mill dogs as they acclimate to life in their new homes. Pomegranate comforting cupcake, a hospice foster. According to the Puppy Mill Project, two million puppies are bred annually in an estimated 10,000 mills across the United States, and 1.2 million dogs are euthanized in shelters each year. Adult dogs who can no longer breed are typically discarded or killed after they have served their purpose. The HSUS 2017 Horrible Hundred report, highlights the worse offenses at large-scale dog breeding operations based on federal and state inspection reports. Those citations included dogs with broken jaws, shivering dogs kept outside in the cold, overheated dogs in extreme heat with no access to shade, food dishes filled with rodent feces, dead mice floating in water dishes, odors so offensive that inspectors had to wear masks and one inspector got sick within seconds of exposure, emaciated dogs with ribs showing, infected eyes closed shut, puppy feet falling through wire crates, live maggots living in ulcerated skin and dead puppies decomposing in breeding yards. 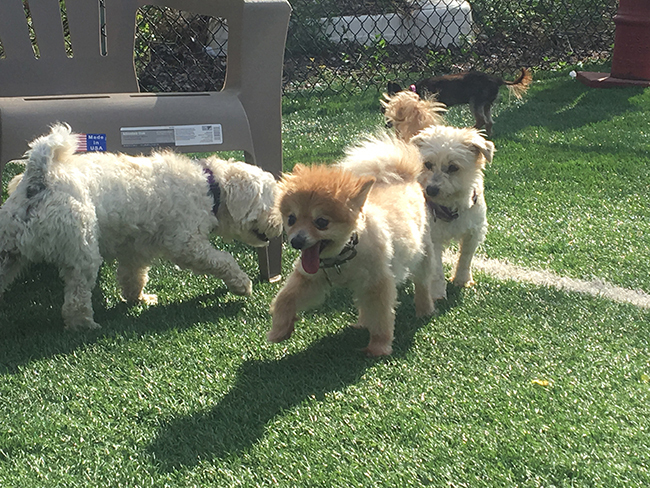 Pomegranate helps socialize puppy mill rescues at the shelter. 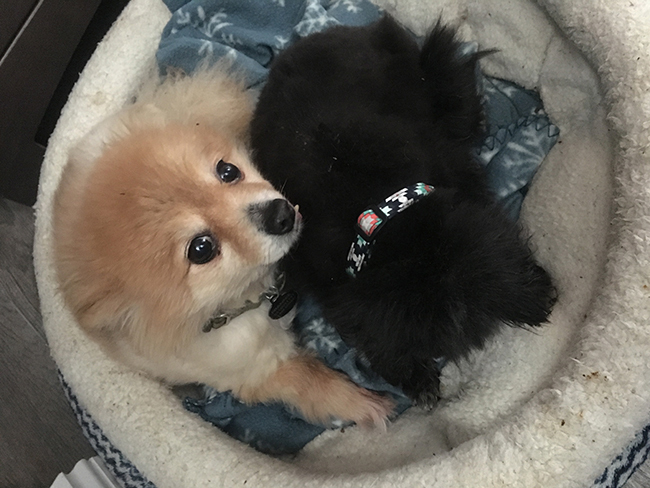 Puppy mill survivors end up in rescue when mills are shut down due to violations or when breeders give up dogs who are no longer profitable to rescue groups. Stew Cutler remembers the first day he met Lily, a chocolate Labrador retriever, who was rescued from a puppy mill in Missouri. She was 4 ½-years-old and had just given birth to her fourth or fifth litter of puppies. It was fate that brought them together. Cutler – a member of RBARI’s Board of Trustees – said he has no doubt that Lily would have been returned to the shelter if another family had adopted her. Six years later Lily is closely bonded with Cutler and gets along well with the other dogs in the house including mill survivor, Mabel, a Chesapeake Bay retriever-Labrador retriever mix. Lily developed hip dysplasia – one of the many health issues associated with puppy mill dogs – has had hip replacement surgery and is currently undergoing water therapy treatments. Both dogs are part of RBARI’s outreach team that works to educate the public about the evils of puppy mills. 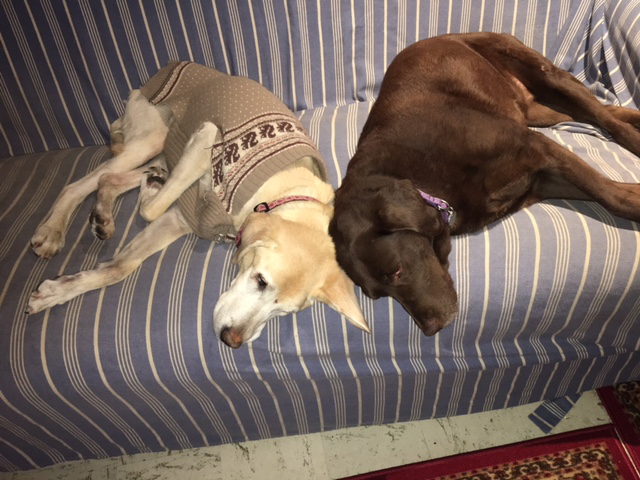 Lily comforts 14-year-old yellow Labrador Mala who is not feeling well. Despite the challenges that go with rehabilitating a puppy mill rescue, it’s not unusual for people to return to RBARI to adopt two and three mill survivors. “Yes, it’s heartbreaking to see the suffering over and over again with each rescue, but we also get the greatest gift in the world and that’s being around these dogs when they get over their fears,” D’Annunzio said. Would you like to become an advocate for puppy mill dogs? Here’s an Advocate’s Guide to Stopping Puppy Mills published by the HSUS.